Movies have gotten considerably leaner in the past 40 years. Filmmakers seem fixed on the notion that audiences need only see what is essential to the story - nothing more, nothing less. This is a good thing, and the Coen brothers may know this better than anybody. Their films tend to have a near-perfect balance of showing, telling and often puzzling ambiguity that makes it fun to talk and think about them long after you leave the theater. Their latest, True Grit, is the brothers’ second remake, and although many consider the original John Wayne version a classic (it won Wayne his only Oscar), it wasn’t perfect. I recently watched that 1969 Henry Hathaway film and after seeing the Coen brothers’ interpretation, it’s easy to where some of the original’s fat could have been trimmed. I realize the 1960s were a different time cinematically and studios and audiences had more patience for stories that took longer to develop. But there is a difference between taking time to develop a story and showing what’s necessary. If the Coen brothers made their version in 1969, it would be interesting to see how similar or different it would be compared to the 2010 rendition. Because they have such an inherent gift for storytelling, one that seems irrespective of time, I’m willing to bet they’d mostly be the same. Instead of having an extended prologue like the original, the new True Grit starts off with just a voiceover. We listen as 14-year-old Mattie Ross (Hailee Steinfeld) tells us her father was killed by his farmhand, Tom Chaney (Josh Brolin), after a drunken card game turned violent. Now she’s seeking a U.S. marshal to hunt him down. Strong-willed and self-reliant, Mattie arrives by train to Fort Smith to identify her father’s body before asking the locals who their best lawman is, preferably the one with the most grit. 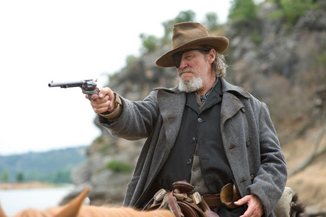 That would be Rooster Cogburn (Jeff Bridges), a gruff, one-eyed drunkard with a reputation for being trigger-happy, although he never misses a shot when it counts.